Leapfrogging of the standalone robo-advisors had shyly started and independent financial advisors in 2016 were still staying on the sidelines – US Financial advisers: confused and plucking daisies. Barron’s just published a great overview of the US sector with The Top Robo Advisors: An Exclusive Ranking in collaboration with Backend Benchmarking, a US analytics firm and publisher of the Robo Report, who tracks 28 current robo providers, a mix of independent pure plays and legacy-owned subsidiaries. Thanks, Urs Bolt for bringing this to my attention, fresh off the press. Backend Benchmarking publishes a quarterly free report that anyone can sign up for (Aug 18 is the release of the Q2 2018 robo report). Backend Benchmarking put out their first article on Barron’s in the space, also in 2015 Robo Advisors Take On Wall Street. They highlighted the beginning of the insurgency which had begun in 2010 in Betterment (at the time a voice in the wilderness) and that technology was turning asset allocation models into a commodity service. 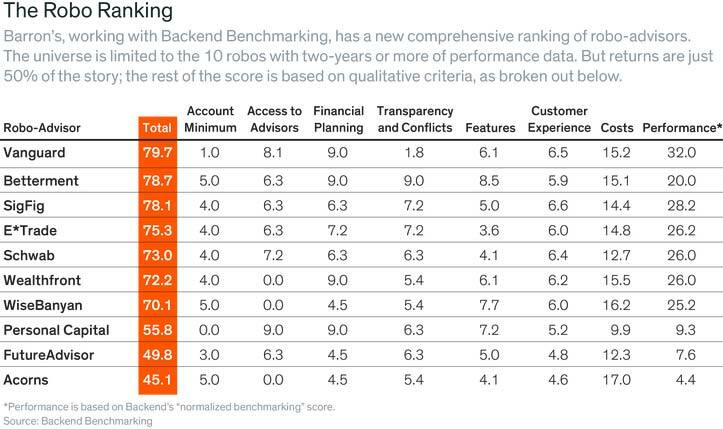 Fast forward to today and the founder of Backend Benchmarking, Ken Schapiro who is a financial advisor, has spent $500,000 funding accounts at 28 robo providers which allow his analytics firm to monitor performance and changes to the robos’ products. They have created a scoring system for all sorts of factors that maybe differentiators in the space. Five out of the eight factors are qualitative, like transparency, customer experience, conflicts of interest, access to human advisors, and financial planning services. For now, they include 10 service providers, half of which are standalone; based on 2yrs worth of data. They will be adding Ellevest, SoFi, Fidelity, Wells Fargo, and T. Rowe Price in their future rankings. They are choosing not to include Hedgeable and Learnvest, because they are predominantly active allocators. 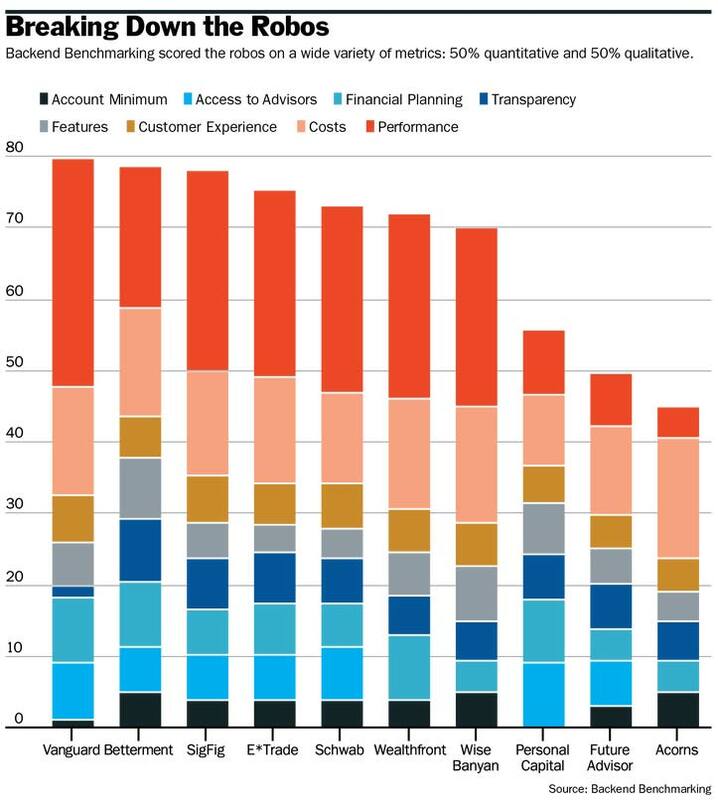 Performance comparison is presented using their in-house normalized benchmarking which shows Vanguard on the top. How many “Low intent” end customers have been acquired and at what cost? “Low intent” (a term used a lot from Envizage) prospects are those that don’t know what action to take, for example, how much to save, how much to borrow, how much to invest etc. In other words, how many genuinely and fully “underserved” clients are being served in these $200billion? Because, if it is me and you, moving from being served from one incumbent to a robo-service, then this is an upgrade, it is good in terms of increasing the competitiveness of the market, but its impact in terms of genuine democratization and opening access, is not evidenced. Why hasn’t the culture changed in terms of transparency? Schapiro reports and I believe him, that in several occasions his accounts were shut down with one excuse or another. I have a similar personal experience when we proposed to a couple of standalone robo-advisors in Europe to join the free Investment by Objective service (IBO) and provide real-time performance (anonymized) data towards developing an index and also using that to adjust models – Swiss pictograms for investment performance – Performance Watcher.